The Ordway Center for the Performing Arts Concert Hall expansion by HGA recently received a 2016 Excellence in Structural Engineering Award from the National Council of Structural Engineers Associations (NCSEA). The awards have been given annually since 1998 and highlight some of the best examples of structural ingenuity throughout the world. The expansion and renovation of Ben Thompson’s iconic Saint Paul performance venue replaced an underutilized 300-seat theater with a 1,100-seat Concert Hall, integrating new lobbies and production support space. Fitting the larger Concert Hall into the footprint of the small theater mandated creative structural solutions. Inventive sequencing, including building a portion of the new structure inside the original theater prior to demolition, was required to keep the Ordway Center operational through construction. The addition’s exterior extends the rhythm of copper and glass bay windows overlooking St. Paul’s Rice Park – expanding the breathtaking city views from the elevated lobbies. 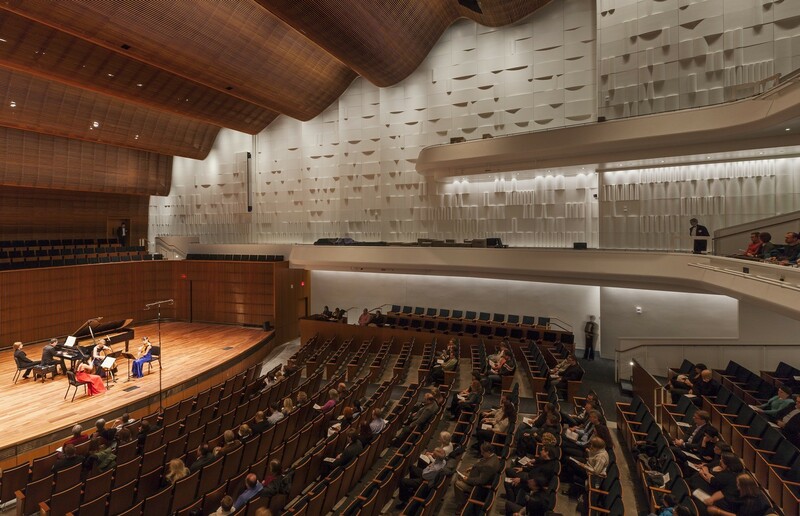 In the concert hall an undulating wood ceiling and textured plaster walls warmly wrap both the audience and the musicians to create a physically and acoustically intimate experience. The HGA engineering project team includes Paul Asp, Jon Wacker, Jake Turgeon, Sean Cotton, Zina Dvoskin and Tomas Amor. Read more about the NCSEA awards here at http://www.ncsea.com/awards/.